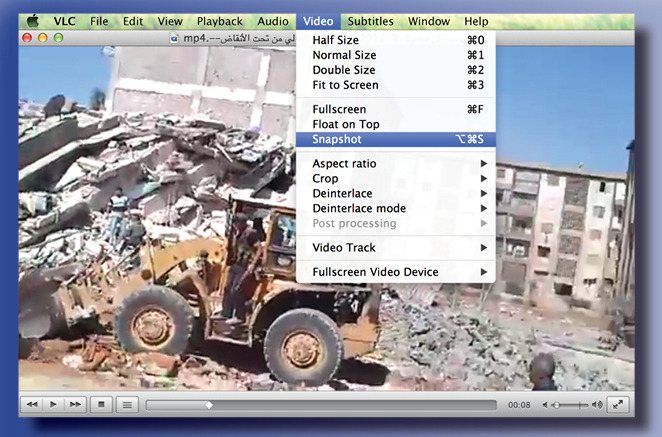 Open the video in the VLC Video Player and play the video. Consider having the video run in slow motion to aid with identifying appropriate frames. Tip about selecting frames: Look for a segment of the video when the camera sweeps over the area you want covered in a relatively short space of time. An ideal set of images has at least half a frame-width of overlap between each adjacent image. Less than that and the photo stitcher program will have difficulty. More than that doesn’t seem to be necessary. If you have identified an appropriate segment from which you can pull frames, start taking several snapshots or “screenshots”, which will later be stitched together to create one single image. Repeat this step until you have enough frames. Next, put all the individual snapshots that you have extracted from the video into a separate folder. (Note: On a Mac, the snapshots will be saved in the pictures folder by default). 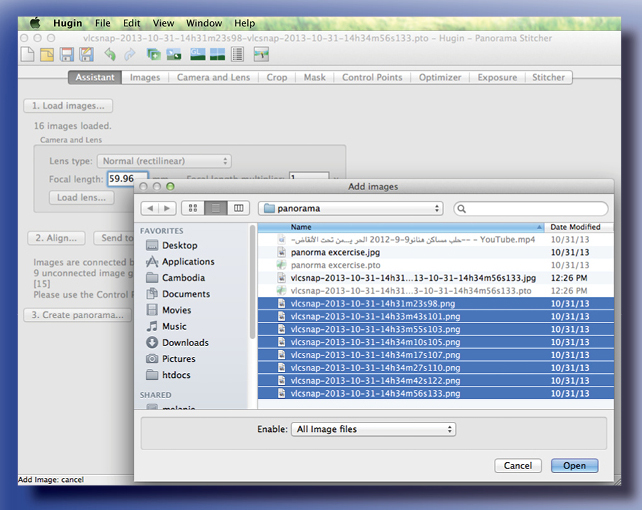 Open Hugin, click “Load Images” and select all snapshots you have extracted from the video. 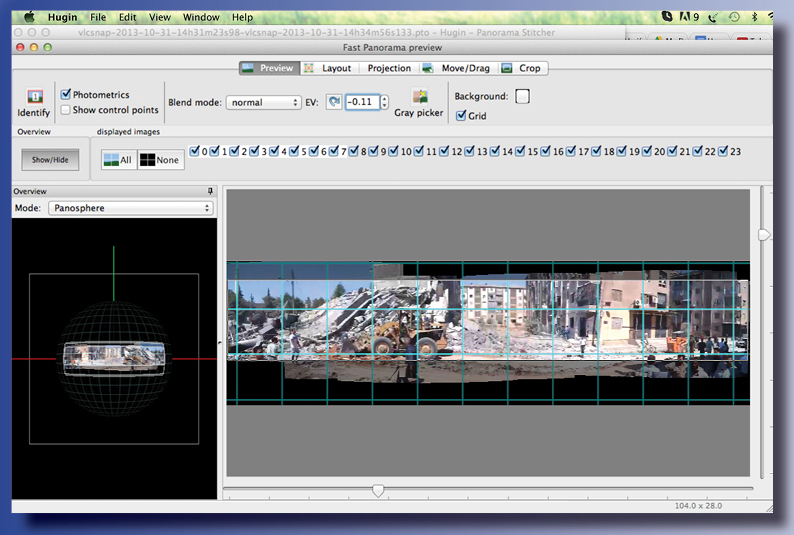 After clicking “Align”, wait until the processing is finished and the “Fast Panorama Preview” opens. If the images look disconnected or mis-aligned, continue with the next step. 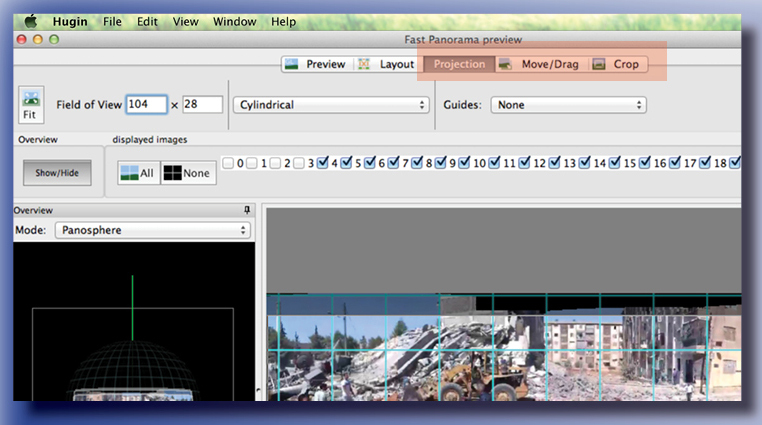 Close the “Fast Panorama Preview” window and click on the “Control Points” tab in the main Hugin window . General advice about Control Points: Control Points are the overlapping points between each pair of overlapping images. Ideal control points are on stationary objects that have a clear corner or line that can be matched between photos. Each overlapping pair should have at least 4 or 5 points between them, spread out if possible. Open the Fast Panorama Preview again and proceed to next step. 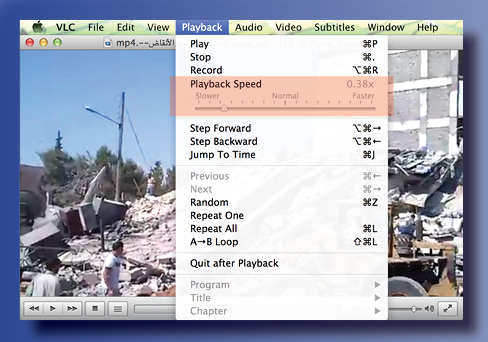 After closing the “Fast Panorama Preview”, you can select the output format (for example .jpg) under the “Stichter” tab. Click “Stitch” to create your panorama (it will be saved in the same folder that contains the snapshots from the video).